According to the Graph Expo keynote in Chicago back in September, Direct Mail is making a comeback. To offer the best opportunity for your customers, you are going to need the right direct mail equipment to support your production. So, let’s take a look at the different equipment you may need to create effective direct mail pieces for your customers. If you are sending out letters in envelopes, there are a host of equipment that can support those operations. You may want to start with a high-end envelope printer. 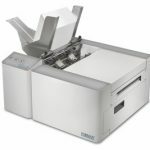 New to the market is the Formax Colormax 7 envelope printer. This machine will print high quality color envelopes to help your customer’s material stand out among the rest. Once the envelopes are printed you are going to need to stuff the envelopes. The Formax FD6102 Envelope Stuffing Machine it all for you. It will fold your document and stuff it into the envelope for you all at once. There is no need for a folding machine and an inserter, this does it all in one. For postcard production, we are going to look at a couple of options for direct mail equipment. Sometimes, you are going to either laminate or uv coat your mailers for protection and presentation. D&K Brilliance overlaminates provides you multiple applications for postcard production. They offer gloss, matte, canvas, or soft touch. In a pile of direct mail pices, a laminated postcard will stand out among the rest for its bright colors and touch. In addition, D&K have the best commercial wide format laminators for your operation. UV Coating provides a similar effect on postcards. UV Coating is cheaper by the square foot and has multiple options like Gloss and Matte. Not only does it provide protection for your mailers, it too can bring out the colors of your printed document. 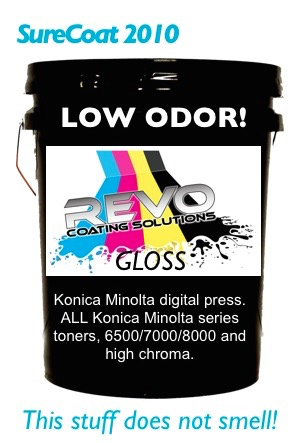 It’s important to have a good uv coating fluid like REVO Low Odor UV Coating. 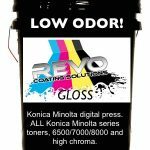 It makes your mailers look fantastic and is applied with low odor during application. REVO Low Odor UV Coating works well with all uv coating manufacturers like American Ultraviolet, Duplo or Tec Lighting. Either the D&K Brilliance Overlaminates or the REVO UV Coating Fluids can help you produce a great direct mail piece for your customers. Next Post:Business Card Slitter For Your Print Shop.